How wrong the egalitarian movement is in its assertion that "the rich are getting richer, the poor are getting poorer" is proved by this chart. Reason, science applied to production has lifted more people out of agrarian subsistence than any economic model before it. That's why this reality must be suppressed at all cost. Not just an entire industry depends on the denial. Upholding the equality gap is crucial to the Leftist moral narrative. The moment the truth is exposed they have no base for existence. Inequality is also their perpetual call to action, the fuel of social strife. This is the reason why the clarion call, "the rich are getting richer'' must be injected into the meme stream with forceful regularity. And sad enough, nearly everyone is taking the lie at face value. The premise is not just metaphysically untrue, but is also morally wrong. There will always be differences between people. As moral beings, but also in income and in the accumulation of wealth. Money is not what drives a producer, or any mentally healthy person: it's self realization and setting goals and achieving them. Breaking the legs of anyone with an ambition will finally land us all in a mass grave. Only in death we're all equal. Can't wait for Yaron Brook's new book in which all will be explained. 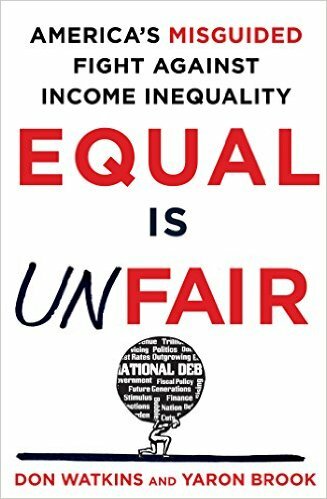 In the meantime here's some reading how the income equality logic is continuing to contribute to much of the world's misery. 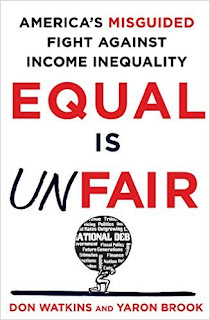 Book Announcement: "Equal Is Unfair"
A new book by Don Watkins and @YaronBrook is coming out in spring 2016 entitled "Equal is unfair", subtitled the misguided fight against income equality; the rejection of Nihilism. It can be pre-ordered on Amazon. "Equal Is Unfair" is expected in the spring of next year in time for the Presidential Elections campaigns. By the same authors, The Free Market Revolution. More details and video on "Why Businessmen Should Not Give Something Back". Follow the Ayn Rand Institute on Facebook. Blog.